Do you have a damaged front or rear bumper cover and you’re not sure what to do? We put together this guide to educate you on everything you need to know about the bumper covers on your Ford. On the front and rear of your Ford are impact bars, which are metal bars attached to the frame of the car. Impact bars are designed to absorb as much impact as possible in a crash. However, impact bars are pretty much eyesores. Bumper covers, which are molded from plastic, provide aesthetics. 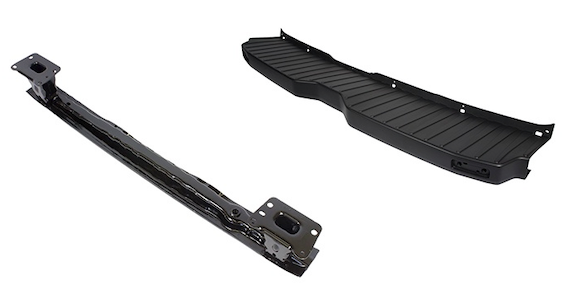 Bumper covers are affixed in front of the impact bars to provide a streamlined appearance. They also are flexible enough to give and spring back from a minor impact. To Replace or Not to Replace Your Bumper Cover? Replacing your bumper cover costs money, and it is a time-consuming project. So it’s a good idea to take the time to make sure your bumper cover is damaged enough to warrant a replacement. This guide is just what you need to properly determine if your bumper cover needs to be replaced. To sum it up, your bumper cover only needs to be replaced when its structural integrity is either compromised or in a position to be compromised in the future. OEM, Aftermarket, New, or Used? There are so many different options available, so it’s easy to get overwhelmed while shopping for a replacement bumper cover. Which type delivers the most value, though? If you ask us, a brand new OEM bumper cover is the best option. OEM bumper covers beat aftermarket covers in terms of quality, fitment, warranty, and more. This comparison guide covers all the factors to consider while shopping for a replacement bumper cover.